This weekend, October 15 and 16, is one of the best of the entire Chicago year. That's because it's Open House Chicago, when hundreds of buildings in and around the city open their doors so that mere mortals like you can explore! I've already publicly declared my love for this wonderful annual event. Now here's a list, arranged roughly from north to south, of some of the more interesting-looking of this year's offerings. A warning: check the Open House website before you go to make sure that the site you want to see will be open when you get there. Frances Willard House Museum, Evanston: Come see the home of the former president of the Women's Christian Temperance Union. Then grab a nip at the FEW Distillery, Evanston's first, named for Ms. Willard herself. Saint Scholastica Monastery Chapel, Rogers Park: The chapel has murals. The grounds have a labyrinth. Colvin House, Edgewater: A 1909 George Maher mansion and the future home of Creative Coworking. With its marble staircases, intricately designed pillars and ceilings, and elaborate chandelier, it's undoubtedly a much nicer office than yours. Jefferson Masonic Temple, Jefferson Park and Most Worshipful Prince Hall Grand Lodge, Englewood: If you've ever been curious about what the inside of a Masonic lodge looks like, here's your chance. ICA GreenRise, Uptown: The top floors of this 1920s office building have been converted to an energy-efficient residential co-op, with indoor agriculture, a kitchen composting system, and solar panels. Garfield/Clarendon Model Railroad Club, Uptown: One of the country's largest model railroads chugs along 1,400 feet of track through a miniature Appalachian landscape. Saint Alphonsus Roman Catholic Church, Lakeview: The interior ceiling looks like a fireworks display. That seems reason enough to drop in. Old Chicago Inn, Lakeview: At this restored B&B, it's all 1920s all the time. The password to the speakeasy is "Railway Exchange." Brewster Building, Lincoln Park and Yale Building, Englewood: The ordinary brick exteriors of these two 1890s apartment buildings hide sunlit glass atria with interior walkways. The Yale Building was originally luxury housing for the 1893 World's Fair; now it's senior apartments. The Brewster Building has been immortalized in Child's Play. Chicago Scenic Studios, Goose Island: Saturday is your one chance to visit this studio and warehouse where the scenery for many Chicago theaters and cultural institutions is manufactured. Holy Trinity Russian Orthodox Cathedral, Ukrainian Village: This is one of just two churches designed by Louis Sullivan. Studio Gang Architects, West Town: Tour the workspace of Jeanne Gang, our city's MacArthur-certified genius architect. Big Monster Toys, Near West Side: Where many of the world's toys come from. Studio Manarchy, Near West Side: Dennis Manarchy's studio, once a maple syrup factory, houses the world's largest camera (it's nearly the size of a semi truck). McCormick Bridgehouse and Chicago River Museum, Near North: Here's your chance to see the the Michigan Avenue Bridge in action! Chicago Architecture Foundation, Loop: The good folks of the CAF are the people who organize Open House Chicago. Stop by to thank them in person and admire their 1,100-building scale model of the city. Nichols Tower, Homan Square: It seems to be the fate of anything named Sears Tower to change its name. 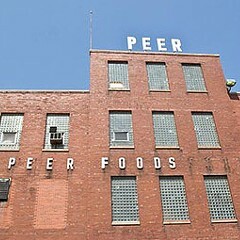 This is the original, dating back to 1906, the last remaining part of the original Sears, Roebuck complex. It just reopened in its newest incarnation as a community center. McCormick Place Rooftop Farm, South Loop: Did you know that there's a farm on top of the west building of McCormick Place? Now you do, and this weekend you can even go see it. Palmer Printing, South Loop: The last printing facility on Printers Row. Clarke House Museum, Prairie Avenue: Built in 1836, the Clarke House is the oldest existing structure within Chicago's original boundaries. Two more 19th-century mansions, the Keith House and the Glessner House Museum, are a block away. The Forum, Bronzeville and Cinderella Ballroom, Woodlawn: Relive the south side's glory years as an entertainment district at these two old dance halls. The Cinderella has been restored. The Forum is still in progress. The Swift Mansion, Bronzeville: Originally a wedding gift from meatpacking baron Gustavus Swift to his daughter Helen (how tasteful! 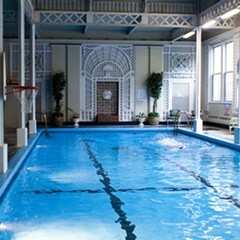 ), the mansion is now home to the Inner City Youth and Adult Foundation. But guess what? It's also for sale! Ling Shen Ching Tze Buddhist Temple, Bridgeport: An 1894 Burnham and Root church that's been used as a Buddhist temple since 1992. The Plant, Back of the Yards: A former meatpacking facility that's been transformed into a vertical farm. Stockyards Brick, Back of the Yards: What used to be Swift meatpacking warehouse has been turned into a showroom of salvaged pieces from torn-down buildings. Saint Benedict the African Roman Catholic Church, Englewood: One of the rare churches constructed for an African-American community, Saint Benedict also has one of the nation's largest baptismal pools, holding 10,000 gallons. WGN Flag and Decorating Company, South Shore: If you've ever wondered where those giant championship banners that hang in United Center come from, this is the place. New Regal Theater, South Shore: Originally opened in 1927 as the Avalon Theater, this gorgeous, old-school movie palace has been mostly closed since 2003. 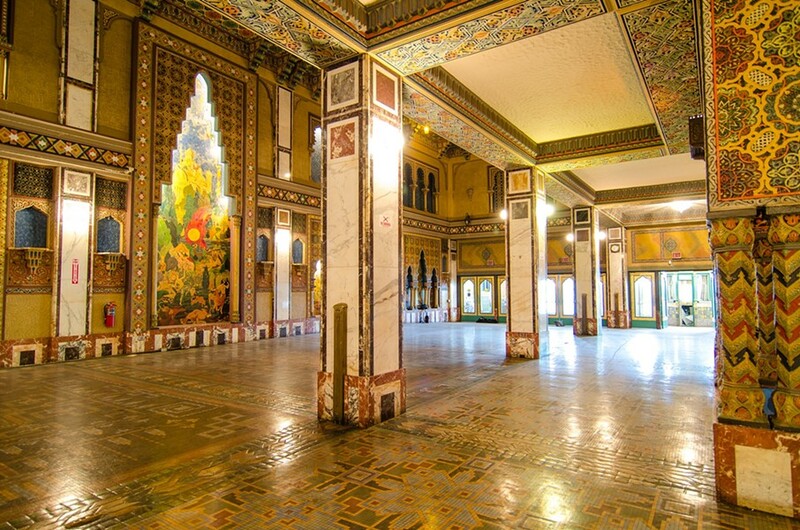 This is a rare opportunity to see the Moorish-style interior. John Edel of Bubbly Dynamics is bringing vertical agriculture to the south side.